In January 2017, Lila was selected to serve on a panel of five judges, chaired by Baroness Lola Young, for the 49th Annual Man Booker Prize for Fiction. The following October, the jury selected Lincoln in the Bardo by George Saunders as the 2017 winner. From April 25–May 1, 2016, Lila took part in the PEN World Voices Festival. The NYU School of Law hosted "In Conversation: Salman Rushdie and Lila Azam Zanganeh". From October 22–25, 2015, Lila participated in Zurich liest 2015, including an interview with the poet and author Ilija Trojanow. From July 3–July 7, 2013, Lila was invited to participate in FLIP: Paraty International Literary Festival as a featured author. From January 24–27, Lila participated in the 2013 Hay Festival Cartagena de Indias Colombia. Along with Philipp Blom, Paul Dolan, Dinaw Mengestu, and John Ralston Saul, Lila engaged in a discussion with Hay Festival founder Peter Florence. She was also part of a conversation with author Juan Gabriel Vásquez and editor Valerie Miles (Duomo Ediciones). 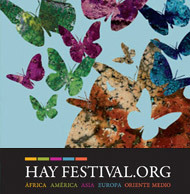 In October 2012, Lila was a featured contributor to the Hay Festival in Xalapa, Mexico. Lauren Elkin joined Lila at Shakespeare and Company in Paris to discuss "the shredding of straightjackets" in life and art as well as the sensuous visions of Vladimir Nabokov. "We read to re-enchant the world." Lila presented Love & Literature at Tilburg Univeristy in the Netherlands as part of the Nexus Institute, an organization that brings together the world's foremost intellectuals, artists and politicians. The Greene Space (WNYC): Catherine Millet, Jean-Christophe Valtat, and Edmund White took part in a discussion hosted by Lila about Proust's enduring legacy and his motifs of love and jealousy. The inaugural Écrivains du Monde festival featured Lila and 27 other writers from 19 different countries. Lila presented The Enchanter: Nabokov and Happiness for the first time in German at the Internationales Literaturfestival Berlin 2013. Lila hosted the final session of the BOZAR Book Club in Brussels, Belgium. She introduced the novel Ulysses by James Joyce. At the 2013 International Conference "Vladimir Nabokov et la France," Lila discussed the work of Vladimir Nabokov with Brice Matthieussent, Michel Schneider, and Paula Jacques. In a literary meeting at the Odeon Theater in Paris, host Paula Jacques and Lila discussed the work and life of Vladimir Nabokov, as well as Lila's book L'Enchanteur: Nabokov et le bonheur. L'ancora del Mediterraneo sponsored Lila's presentation of her book, Un incantevole sogno di felicità: Nabokov, le farfalle e la gioia di vivere at Salone internazionale del libro di Torino. Lila spoke on a panel hosted by the Northeast Modern Language Association: "Crossing the dark sky of exile’: Vladimir Nabokov and the Issue of Exile"
Lila received the 2011 Roger Shattuck Prize for Criticism (introduced by Adam Shatz) at The Center for Fiction. Lila took part in the Festival of New French Writing at New York University. Lila moderated two panels at the 2009 Festival of New French Writing with authors Marie N'Diaye and Abdourahman Waberi in conversation with Francine Du Plessix Gray and Philip Gourevitch. Lila took part in the first edition of the International Forum of the Novel, in Lyon, France, acting as the moderator for the round-table discussions: "I as primary matter," "Literature and trauma: from past to present violence," and "Confronting the reality of our characters; a novelist's view." Lila appeared on a panel for the Association of Writers & Writing Programs at their annual conference in Atlanta, Georgia. The discussion: Can literature bridge the widening chasm between the Middle East and the West? Lila took part in the Ravello Festival 2006 in Italy. Lila was joined in conversation with Azar Nafisi, Shirin Neshat, Roya Hakakian, Azadeh Moaveni, Naghmeh Zarbafian, and Sussan Deyhim. This sold-out event in the Celeste Bartos Hall (the Library's largest auditorium) was broadcast on BookTV (CSPAN 2). The Levantine Cultural Center hosted several young Iranian intellectuals at Pacific Arts Center. Lila Azam Zanganeh, editor of the Uncensored Iranian Voices anthology, spoke with No god but God author Reza Aslan about the path to peace and democracy in Iran. "South-Asia Rescue," A fundraiser for the victims of the South-Asia earthquake at The Asia Society in New York City. This event, organized and hosted by Lila Azam Zanganeh, raised over $1,000,000 for the International Rescue Committee. The keynote speaker was Hillary Clinton. Lila held a Cultural Diplomacy Seminar at Columbia University: "Translation into English: What's at Stake?" Lila held a Cultural Diplomacy Seminar at Columbia University: "Designing an effective and responsive methodology for cross-cultural dialogue." Lila hosted a discussion at Columbia University titled "Institutionalizing cultural diplomacy in the 21st Century." "Shifting perceptions of the Middle East after the war: A clash of cultures within Iraq" at The Cooper Union in New York City. "Shifting perceptions of the Middle East: US-Iran case study" at The Asia Society in New York City.